Bull Temple is a religious shrine that is unique in itself. Located in Basavangudi, the Temple is positioned at the southern end of Bull Temple Road in Bangalore. The term 'Basavangudi' is derived from the word 'Basava', which means 'Bull'. The special attraction of the temple is a colossal image of bull. 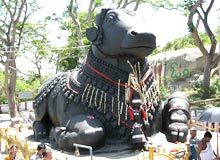 The temple is said to have been built by Kempe Gowda in 1537 A.D. Perched at the top of Bungle Hill, Bull Temple is easily accessible from the city of Bangalore through local buses, auto-rickshaws and taxis.